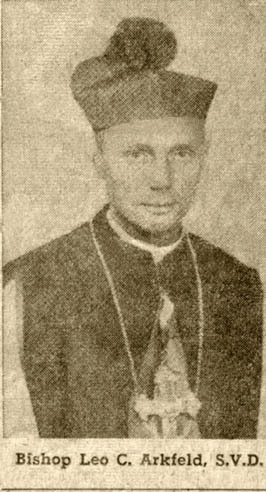 Bishop Leo C. Arkfeld, S.V.D. Sioux City(Special)Bishop Leo. C. Arkfeld, S.V.D., 47-year-old Ordinary of Newak, New Guinea, will appear at the Cathedral hall December 16th to show an hour-long film in Koda-color titled "Jungle Parish "which tells the dramatic story of opening a new mission station in dangerous tribal area of New Guinea. The world famous "Flying Bishop" was recently the target of communist machine guns along the Austria-Hungary border when he began to film the barbed-wire and gun towers erected by the communists to prevent their slaves from fleeing to freedom. Bishop Arkfeld will begin the program with a few words of explanation of the missionary work being done in New Guinea. After the film which is scheduled to begin at 8:30 p.m. he will give the audience a chance to ask questions pertaining to his work in the missions and of the unusual experiences he has encountered performing his work. The Bishop is being sponsored by the Cathedral Holy Name Society and during his stay in Sioux City will visit his cousin, E.B. Dophelde, 1715 Grandview Blvd., who is a member of the Cathedral parish. Having joined the Divine Word Missionaries at the age of 20 and ordained in 1943 he was sent immediately to New Guinea. The unsettled conditions in the islands resulting from World War II resulted in his being assigned to Australia for a year of parish work. While there he took up flying and soon was hailed as one of the best fliers in the region by veteran pilots. Besides the many emergency flights, which have saved so many lives, the flying Bishop logs some 30 regular flights a week in the treacherous flying area of jungles and mountains. He has built his private airstrips on shore lines and hillsides where no one else would dare to land and where he only lands because of the necessity of ministering to the natives. The public throughout the city is cordially invited to attend the talk and witness the film for which there will be no admission price.